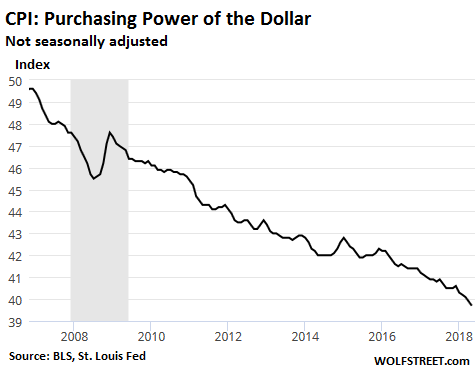 Over the last 12 months, the purchasing power of your dollar has dropped at the fastest rate since 2011. According to the latest data released by the Bureau of Labor and Statistics, the Consumer Price Index (CPI) jumped by 2.8% year-over-year in May. 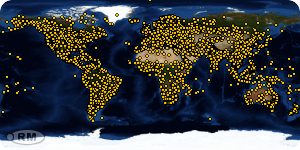 That follows on the heels of a 2.5% leap year-over-year in April. In other words, prices are going up. That�s not good news for people who buy stuff. Pundits and talking heads call a rising CPI inflation. But as Peter Schiff explained in his podcast last week, people often confuse rising prices with inflation. In fact, the CPI merely measures one effect of inflation. And of course, the Federal Reserve drastically expanded the money supply in the wake of the 2008 financial crisis. In simplest terms, the continual climb in CPI means you pay more for less. The purchasing power of the dollar fell 2.93% in May from a year ago, the fastest drop since November 2011. This graph shows the persistent downward trajectory of the value of a dollar. The CPI excluding food and energy rose 2.24% from a year ago, after having already risen 2.14% in April. Two or 3 percent may not sound like much, but those price increases really start to add up over time. In just five years, you�re looking at a 10% to 15% price increase � or a 10 to 15% debasement of your money. And here�s the dirty little secret. Prices are going up even faster than the CPI indicates. The government does all kinds of little accounting tricks to pushes the CPI number down. For example, the CPI for used cars actually fell 1.7% over the last year. In fact, the CPI for used vehicles is at the same level that it was in May 1995. In other words, the price of a used car today is theoretically same as it was more than two decades ago. Now, do you really think a used car is cheaper today than it was 23 years ago? Of course not. An article in Wolf Street explains the number. The devaluing of the dollar is on purpose. The Federal Reserve wants an �inflation rate� of 2%. Central bankers think it�s good when the purchasing power of the dollar falls. And it is good � for the bankers and the political class who get new dollars pumped into the system first. For the rest of us, not so much, as the Tooth Fairy aptly demonstrates. 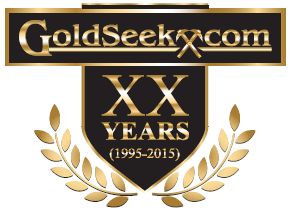 This is one reason why it�s a good idea to buy gold and silver. Historically, precious metals serve as a hedge against inflation. Typically, as the value of the dollar drops, the price of gold and silver in dollars goes up � just like the price of bread and gasoline go up.